Theologian Thomas M. Bolin, Ph.D., will present “Turtles All the Way Down: New Ways of Looking at Old Texts” on campus Tuesday, Feb. 21, as part of the Escobedo Saint John’s Bible Lecture Series. 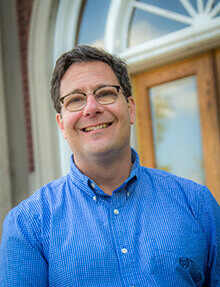 Bolin is Professor of Theology and Religious Studies at St. Norbert College in De Pere, Wisconsin, and a former Theology department faculty member at St. Mary’s University. He will discuss wisdom, using The Saint John’s Bible as a guide for his presentation. Volumes of the Bible will be on display. Bolin’s research focuses on the ancient literary and cultural contexts of the Hebrew Bible as well as ancient Israelite history, specifically wisdom literature and post-exilic texts. He also focuses on hermeneutics – interpretation of biblical writing. He teaches courses in Theology, Religious Studies and Classical Studies at St. Norbert. The event will be held at 4 p.m. in Assumption Chapel in Reinbolt Hall. Those traveling to campus are asked to park in Lot V, off Camino Santa Maria; Lot D, near the NW 36th Street entrance; or Lot H, near the Culebra Road entrance. On Wednesday, Feb. 22, Bolin will present “Through a Glass Darkly: Image and Text in the Book of Job” as part of the University’s Saint John’s Bible outreach program to make the Bible accessible to San Antonio and beyond. The public is invited to attend. Bolin will examine the ambiguities in Job and how Jewish and Christian readers have addressed them. Bolin will look at a number of manuscripts of Job, including The Saint John’s Bible, to see how the interplay between word and picture helps create understanding. The event will be held at 7 p.m. at St. Matthew Catholic Church, McDonald Family Center, Room 106, 10703 Wurzbach Road.